Sigue is a money transfer service with offices worldwide. Their headquarters is in Sylmar so we’ve done a few different signs for a couple of their Los Angeles locations. While we’ve done exterior logo signs to help with building identity and to advertise the location, they also wanted a lobby sign for one of the Los Angeles offices. 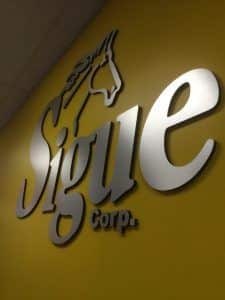 Sigue Corporation has been dedicated to providing excellence in their money transfer services since 1996. Sigue is known for their excellent customer service and is one of the largest and most respected companies in the industry. In the beginning, Sigue expanded operations to over 15 Latin American countries. By the late 2000s, the company further consolidated its leadership position in the United States to Latin American corridors through a series of domestic acquisitions. 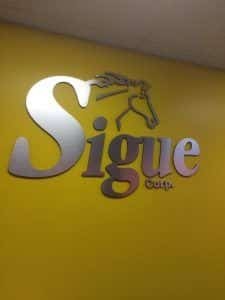 2011 is when Sigue went global by acquiring a company with expensive international operations. Sigue Corporation now has offices in the United States, Mexico, India, London, and France. Being an international company, their logo is very important because it can be recognized worldwide. Because of this and because they have visitors in their offices, they reached out to us for an interior logo sign. As you can see from the photos, this is a dimensional sign with a metal finish. A silver metallic sign is very popular for offices because silver can look good with many different colors. For example, there may not be a lot of colors that will go well with the bright yellow wall. 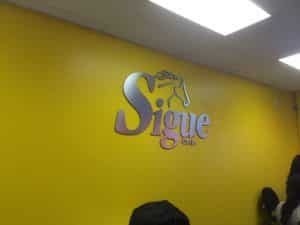 Most of the other signs we’ve made for Sigue are silver or at least a neutral color. To give the client a metal sign at an affordable cost, we used 1/2″ black acrylic with brushed aluminum laminate faces so the sign would have a metal look without the cost of a full-metal sign. You can still see the acrylic color from the sides, but if you use a neutral and low-key color like black, it is not too noticeable.